You are reading the AMP edition of this article. Click here to read on mobile web. Liverpool winger Sadio Mane faces a tense wait for scan results after suffering a potential shoulder injury in training. 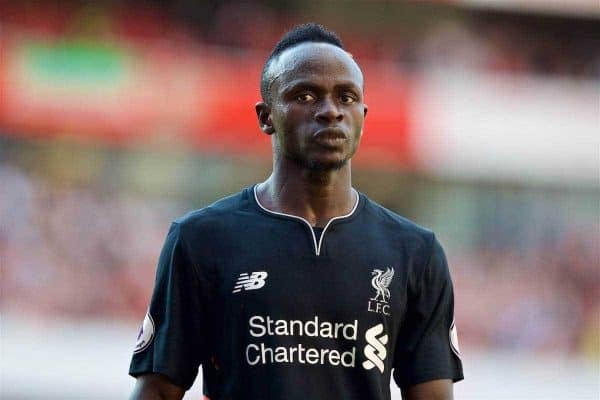 The Senegalese took a knock to the arm at Melwood on Wednesday afternoon, and was taken to hospital for precautionary scans. According to the Express‘ Paul Joyce, Liverpool will now await the results in order to “to ascertain the extent of the problem,” which would be a major blow at this early stage of the season. Mane enjoyed a sensational debut in Sunday’s 4-3 victory away to Arsenal in the Premier League, and is poised to take up a key role in Jurgen Klopp‘s attack this season. The 24-year-old went some length to justifying his £30 million transfer fee with an excellent solo goal at the Emirates Stadium, dancing past Calum Chambers and Nacho Monreal before firing into the top corner. The pace, skill and direct running that Mane provides on the right flank served as an ideal contrast to the industry and quality of Roberto Firmino and Philippe Coutinho. Without him, however, Klopp would be required to find an alternative, with another right-sided attacker, Sheyi Ojo, sidelined for a month with a back injury. One option would be Serbian winger Lazar Markovic, but the 22-year-old is far from full fitness and wasn’t even included in Klopp’s squad in north London. Markovic possesses similar qualities to Mane, however, and if the former Southampton man is out he could be offered the chance to prove himself to Klopp. Adam Lallana could also return to the role he played throughout 2015/16, but his move into a central position in Klopp’s three-man midfield had previously hinted at a more effective use of his talents. The return of Emre Can to the German’s starting lineup, however, could accommodate for this, with the former Bayern Munich youth able to partner Jordan Henderson and Georginio Wijnaldum. Still, it remains to be seen whether Mane’s injury is serious, but losing the winger for any length so early in the season would be a disappointment.